Come on, all girls have been there, just waiting for the phone to ring, minutes dragging on to feel like hours. This painting shows all the emotion of the girl through a simple pattern and few colors. “Why doesn’t it ring” is simple enough to be dismissed at first but the next time you’re waiting for a call the image will imprint itself on the back of your eyelids. 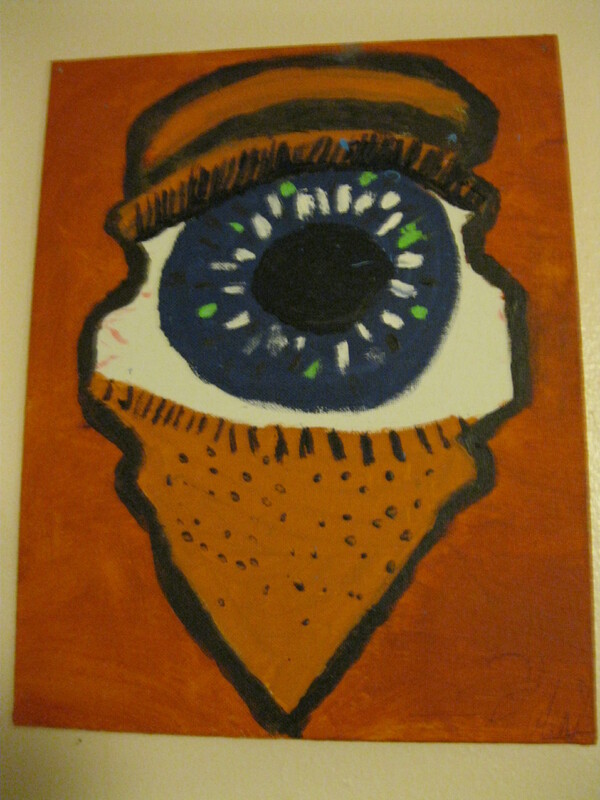 “A Spy’s Eye” Is an eye pressed up to a keyhole, looking through from the outside on the way in. With so much orange in th3e skin and surrounding area the blue eye really stands out. “Grow” like all of Helen’s paintings is done in the acrylic medium. 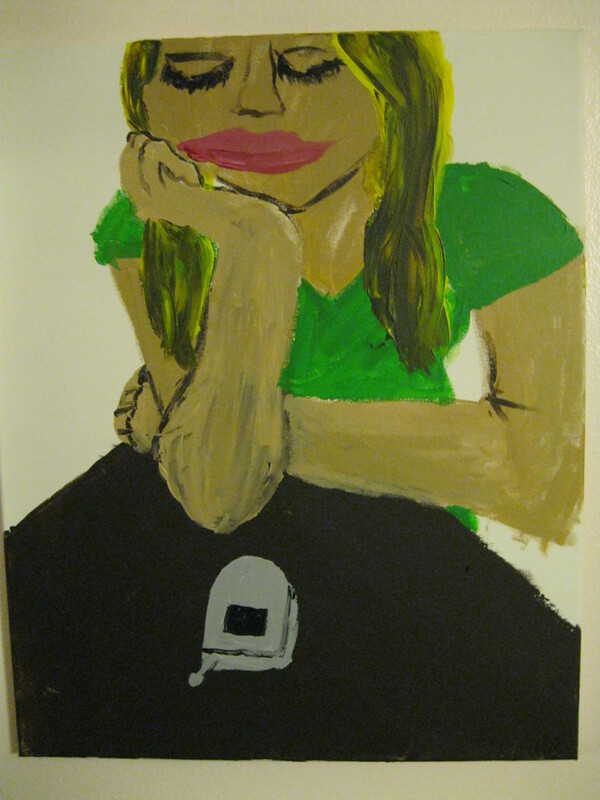 But one thing different about this painting is that it was done with her fingers, no, no brushes were used. 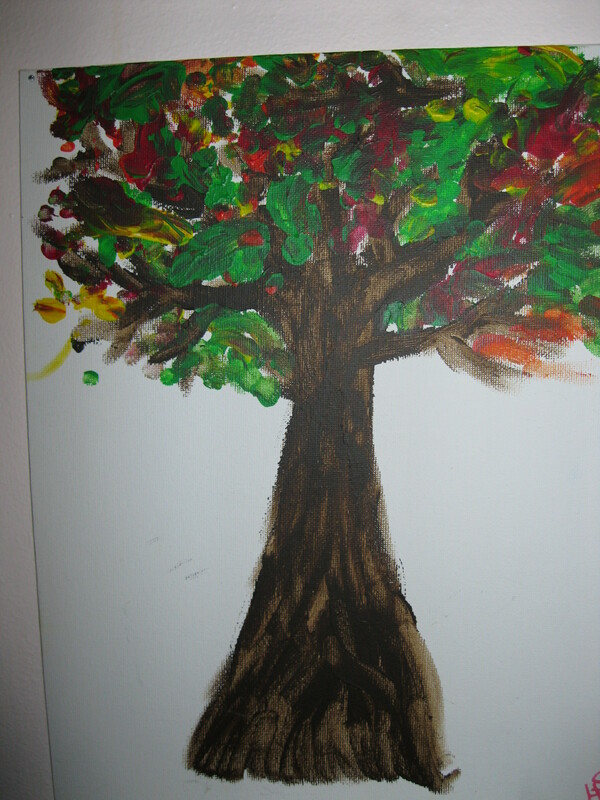 This makes the painting more distinctivve in the lines and strokes. 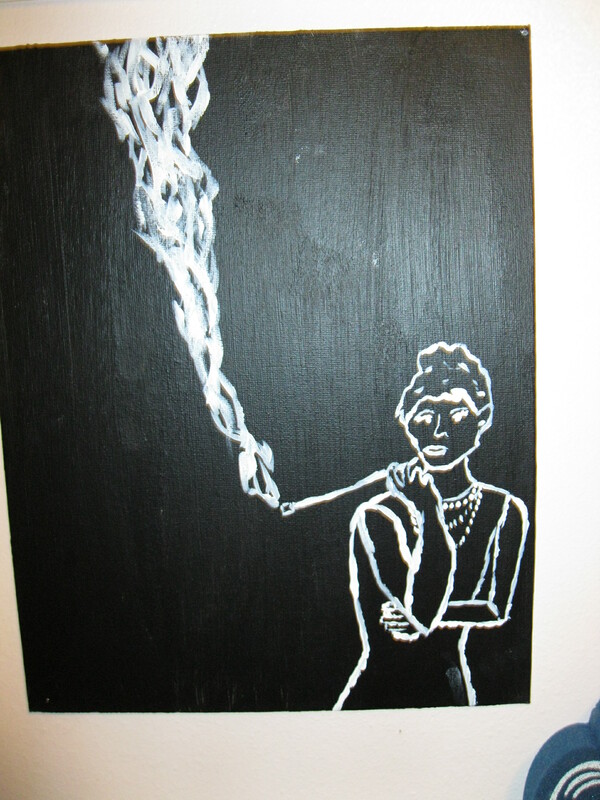 A simple black backround with a simple white outline of actress Audrey Hepburn as in the movie Breakfast at Tiffany’s make a simply sensational piece. It needs no further explanation then what you can see for yourself. A beautiful painting of a beautiful woman. “Nightmare in the clouds” is extremely dramatic and full of intensity. 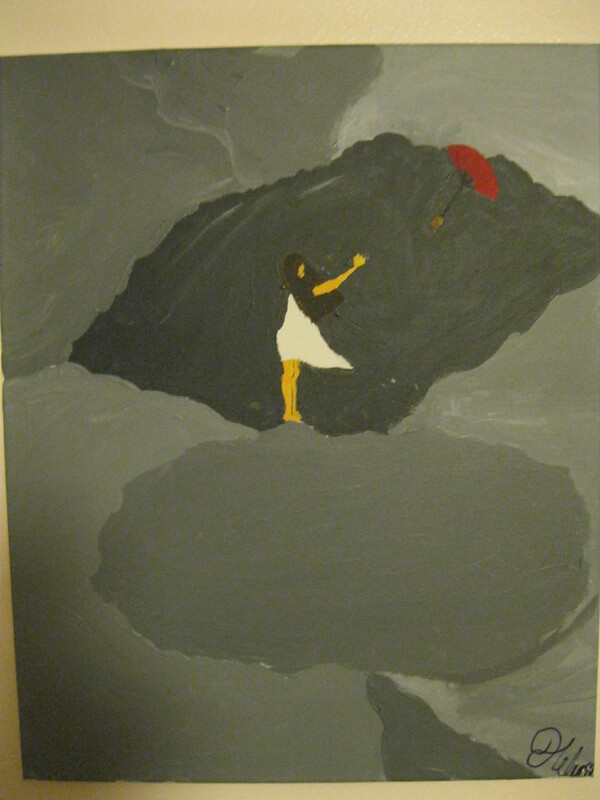 A young girl stuck in a nightmare and her only protection, a small red umbrella is torn from her hands. All of the dark clouds circle a fair girl dressed in white her hair being blown violently in front of her contrast and make the focal point, the young girl, stand out. 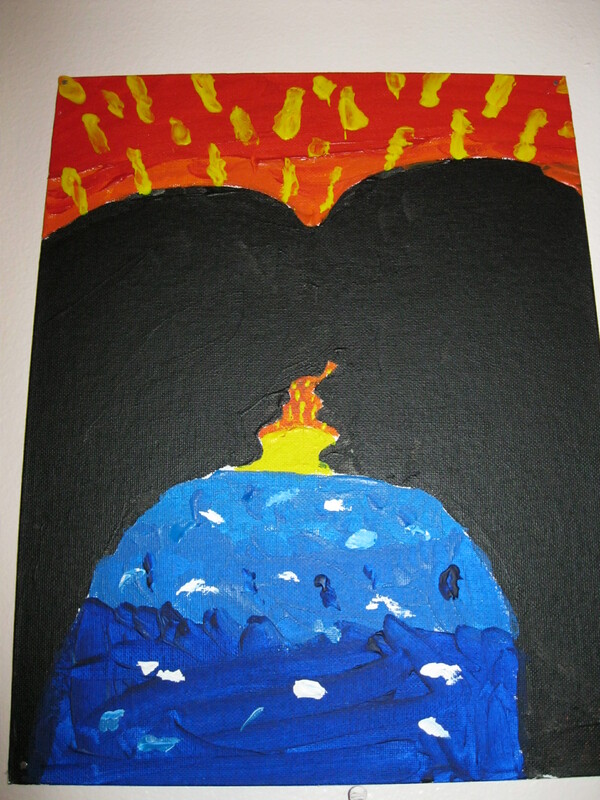 This painting reflect the artists own fear of darkness and large storms. Silhouettes and Sunsets is a simple and romantic piece. Easy to understand and easy to appreciate. A cute couple (though you can’t sere their faces) kissing at sunset on the beach. The bright colors in the back hot colors in the sky and cool in the water come together in a brillant sunset behind plain black silhouettes make this painting simply sensational. 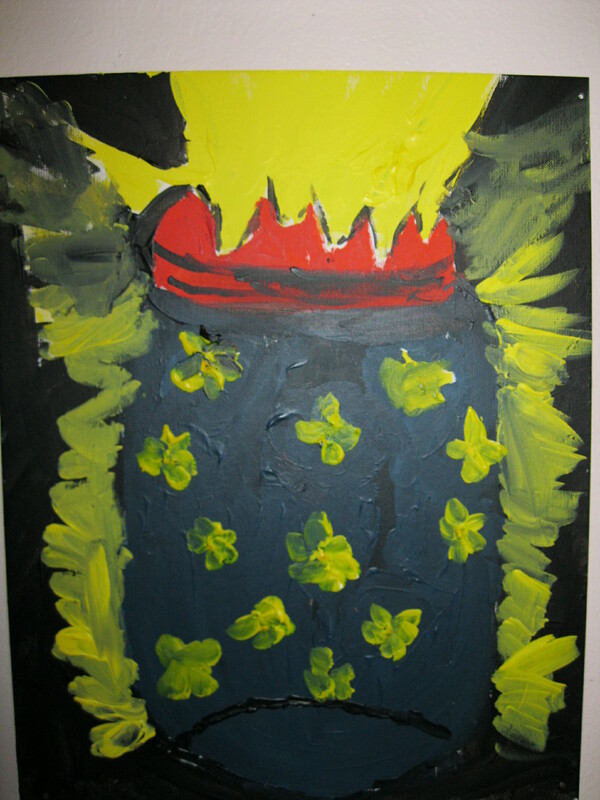 The painting entitled Fireflies by Helen depicts a dear childhood memory of catching fireflies on a warm summer night. and then keeping them in a jar through the night for light. An almost comic color scheme and a dark back round with layers and layers of paint create a dramatic an childhood piece to cherish.